It’s been almost two and a half years since my post about hidden gems within the multitude of (often crappy) products found in CD-R King. Since that post, I’ve found a couple of new interesting finds worth a blog post. No, there won’t be any obvious things here (e.g. the laptop, netbook, tablet, etc). I prefer not-so-obvious items that are mostly relevant to my interests. Ignoring the recent thing with the floods in Thailand, upgrading your hard drive is probably the most practical upgrade you can do with your computer nowadays regardless if you’re using a laptop or a desktop. Mechanical hard drives are getting more efficient in terms of capacity while SSD’s are getting cheaper and faster. Unfortunately, there’s the problem with what to do with the old hard drives. For instance, when I bought a 2TB drive, I had enough storage space to replace 3 of my hard drives. So then I had 3 hard drives that I didn’t have any use for. At this point you might guess “oh he’s going to suggest buying an enclosure“. Sorry, but no. Enclosures are ok if you just have one disk drive on hand. But if you’ve got a bunch of SATA drives, changing drives can be a hassle: you need to open the enclosure to replace the HDD inside. What I’d suggest is to consider getting a docking station. Yes, it’s basically a device that turns your spare SATA HDDs into huge flash drives (or diskettes, if you’re from my generation). At USB 2.0 speed, you’d get around 32MBps transfer speeds which is good enough for backup purposes but too slow for general IO-heavy program use. If you’ve got a motherboard that supports USB 3.0, you may want to check this one out as it supports that newer standard. What if instead of upgrading your hard drive, you instead upgrade your video card to an Eyefinity-equipped AMD card hoping to get some of that single-card triple monitor action. But what if you chose to get three non-DisplayPort monitors and you didn’t read the online discussions saying that you need at least one DisplayPort monitor to enable triple monitor mode? Or what if you do get a DisplayPort monitor, say any of these two monitors from PCHub, but realize that your card and monitor doesn’t come bundled with a DisplayPort cable? Sure, there are DisplayPort cables out there, but the only shop I’ve seen carrying them in Makati (Octagon) only carries the 2 meter cables worth P1.2K. 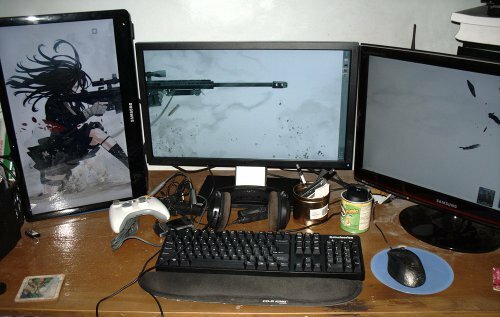 So how do you pull off setup below (relatively) cheaply when you’re living in Metro Manila? 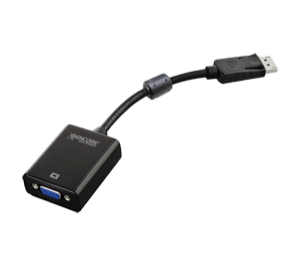 The trick here is that all DisplayPort to VGA adapters are “active” adapters, and thus will be treated as a full DP connection (when you use a “passive” DP to DVI or HDMI adapter, the ones only available in the country, it’s not treated like a DP connected monitor but as another DVI/HDMI connected monitor). 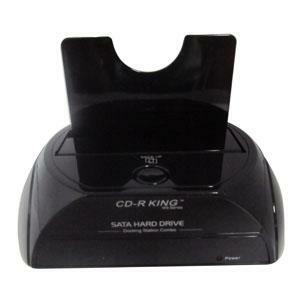 Luckily for me us, CD-R King carries DP to VGA adapters. This last item is like the windmill of the previous list: it’s not really practical, but still pretty notable on its own right. 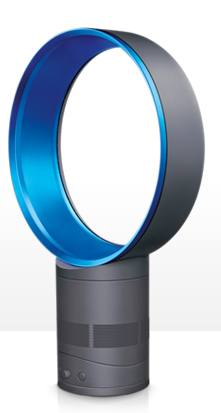 That is a bladeless Dyson Air Multiplier fan, another innovation from the famed industrial designer. It sells for $299 directly from Dyson. And that is the bladeless air multiplier fan sold by CD-R King. 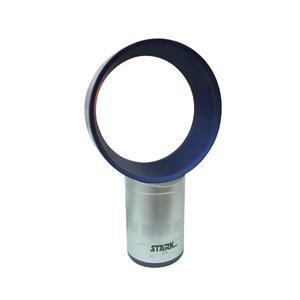 I’ve seen the fan displayed and demoed in some stores, but honestly, I’m not really impressed. Sure, the dimmer (potentiometer?) switch for fine-tuning the strength of the fan is pretty cool (pun intended) and the lack of blades makes it ideal when around kids (but robs them of the robot voice/ghetto auto-tune experience), but overall, it’s just too expensive for the average person. Still, it is five times cheaper than the original. For some people, to experience how it feels to have such a device around without paying an extra 10K (or more, thanks to the wonderfully corrupt Philippine customs bureau) may just be worth it. A word of warning, though. The items above are pretty rare and it’s only at the Cubao Farmers branch that I’ve seen all three on display (though not at the same time). I’ve been buying stuff from this chain for years, often without much incident (except in the case of the wireless LAN USB dongle, which didn’t work after two weeks but fortunately got RMA’d), and from that experience with their products they’re more of a distributor who simply had the logo slapped on, from dozens of manufacturers of differing quality; some do very intensive QA, some don’t and just ship it out regardless of safety concerns — this company ends up taking much of the brunt of flames. Yet we wonder how despite flaming criticism it’s still around and growing by the minute. So our mileage may vary with this company (staffed mostly by non-techies on the front line). Like you, once in a while I find some gems in the rough, that is, really good stuff that actually works. Examples include a USB clone of the Playstation Dual-Shock controller (from the bargain bin), their smallest USB Bluetooth dongle, and of late, a 3-meter length of braided HDMI cable for my friend. And of course, that wifi dongle, which was really handy during critical times. Gonna consider that DP adapter. Damn cool. I am not a "Blogger"
What programming language should I learn? This contents of this blog is licensed under a Creative Commons Attribution-NonCommercial-ShareAlike 3.0 Philippines License.